This season, I find myself gravitating towards slice-of-life shows and comedies more than anything else. I know there are action shows this season that are getting people excited, but I just don’t feel the urge to watch that kind of thing right now. Maybe it’s because there’s some challenging stuff going on in my life that makes me long for the anime equivalent of comfort food, or maybe I’m just not in the mood for giant robots doing fisticuffs. Perhaps I’ll check in with some of the flashier, high-profile shows sometime midseason, but for now, here’s the rest of the warm-and-fuzzy stuff I’ve been cozying up to. 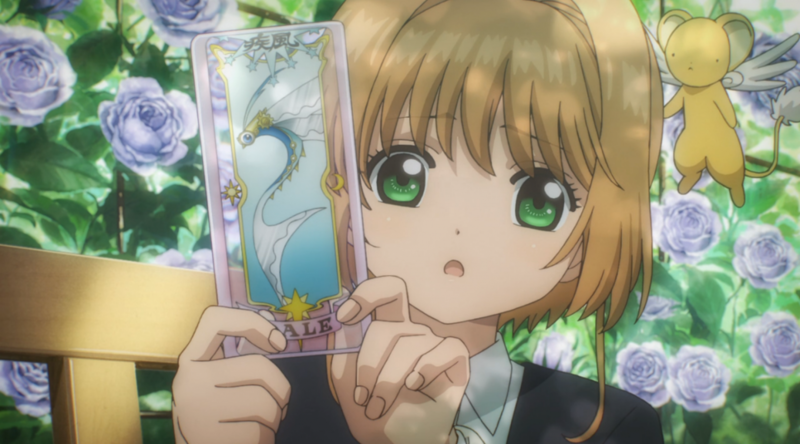 Card Captor Sakura: Clear Card Arc– It’s impressive how good the art and animation was in the original series back in the late ’90s, because this show simultaneously looks state-of-the-art and just like the CCS you remember. Yes, there’s a bit more detail and the CGI effects for the magic are more sophisticated, but it just feels like proper CCS on some level I can’t explain– as opposed to say, Sailor Moon Crystal, which always seemed a bit off to me. I read a little bit of the manga for this arc while it was running in Nakayoshi, and it kind of seemed like same-old, same old. Oh noes, the cards have changed again and Sakura has to hunt them all down, how can this beeeeeee? Still, it’s interesting to see the cards becoming more aggressive, like Windy becoming “Gale.” If there’s some larger theme about the stakes escalating as you get older, I’ll be impressed. Really, the only thing I don’t like is the fact that they’ve added about a foot to Sakura’s height. I know this was to be expected, but dammit, it’s Sakura! I never wanted her to grow up to be a CLAMP Noodle Person! I feel like Sakura’s original design was like the Golden Mean or something, it was the essence of perfection the way it was and messing with it is just stupid. “But she’s in middle school now!” you say? Yeah I don’t care, too busy making Short Sakura-chan FOREVER banners to plaster all over my neighborhood. 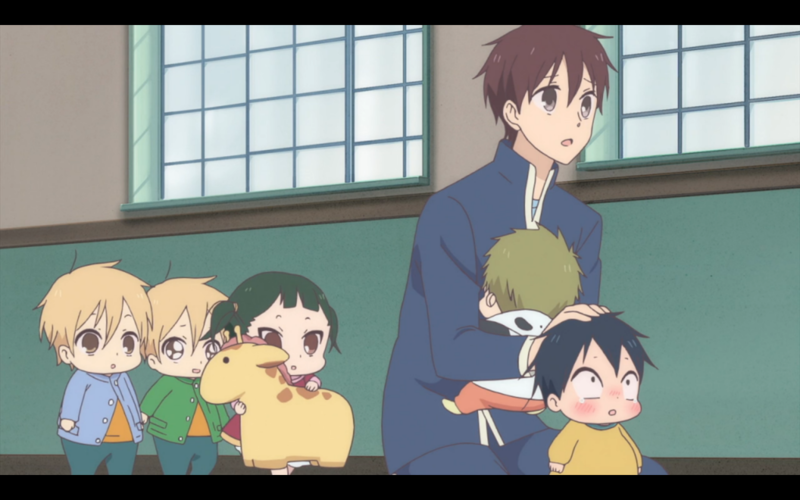 School Babysitters– Moe shows (or shows with cute-appeal for the uninitiated) harness our natural desire to love and protect children to get the viewers to have feelings for the characters; usually moe characters aren’t young children, but they have sufficiently childlike proportions that our protective instinct is invoked. What’s special about a show like School Babysitters is that since it’s actually about really young kids, you’re kind of cutting out the middle man: straight-up cuteness without having to do the mental gymnastics to convince yourself that everyone is really in high school or whatever. This kind of show defies analysis, at least at this point; it’s just a piece of feel-good mind candy that makes the world a slightly better place whenever you watch it. The only thing that mars the perfection is the fact that one character hits his kid brother– and I don’t mean a spanking (where at least you are bonking the kid on their natural shock-absorber), but he hits the kid in the head. Kind of disturbing, but considering the fact that the hitting clearly creates more behavior problems than it solves, it doesn’t seem like the show is condoning this behavior; more just acknowledging that it happens. One nitpick is that several of the kids in the daycare program look like one-year-olds and speak more like three-year-olds, but that’s the kind of thing only viewers with kids will probably notice or care about. I’m still a little bitter about Hanamaru Kindergarten from years ago, so maybe this will be the show about adorable little rugrats that pulls out all the stops. 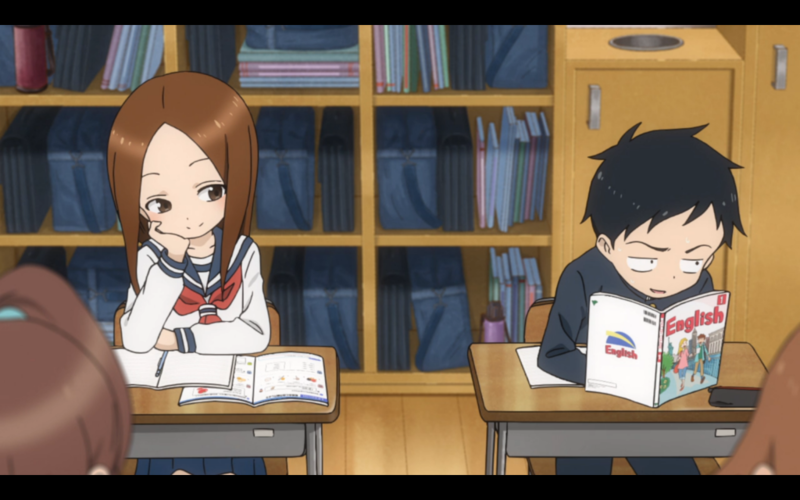 Karakai Jozu no Takagi-san– Kind of weird that there’s no official English title for this one. This has a really simple premise: a clever girl teases the boy sitting next to her. Unbeknownst to him (but totes benownst to us) Takagi actually really likes the object of her torment, Nishikata. Nevertheless, liking him doesn’t stop her from messing with his head in every conceivable way. This show reminds me of Tonari no Seki-kun, with it’s emphasis on two kids goofing off in the back of the classroom. However, whereas the genius of Seki-kun was that it was ambiguous how much Seki-kun was actually trying to distract Rumi, and how much he was just amusing himself, the deliberate nature of Takagi’s teasing can get kind of annoying. Considering the amount of mental anguish Nishikata goes through trying to anticipate how she’ll torture him next, sometimes she just seems like a cold bully instead of a charming scamp. Still, considering how ingenious Takagi’s schemes are, it’s probably for the best; if she weren’t so busy teasing her crush, she’d probably be hatching supervillain-level plots to take over the world. Way to take one for the team, Nishikata. Anyway, this one is in the “maybe I’ll keep up with it if I’m in the mood” pile. Whether or not I watch it probably depends on how nostalgic for Tonari no Seki-kun I’m feeling on any particular day. Sanrio Boys– Considering that I was expecting this show to feel like a commercial for Sanrio products, it’s doing a pretty good job telling an actual story, albeit a simple one. I mean yeah, it is a commercial for Sanrio merch, but the main character spends the first two episodes going through an actual emotional arc and everything. Add the fact that it’s exploring the feelings of teen boys who enjoy things that are considered non-masculine, and how they reconcile that with their still-emerging gender identity, and there’s some genuinely interesting stuff here. All shows that are meant to pimp tiny little erasers and keychains should only be half this interesting. All that said, I have personal baggage here that makes it difficult to fully enjoy Sanrio Boys. 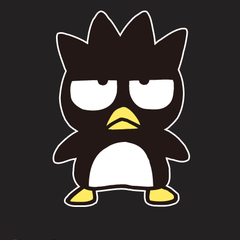 As far as I’m concerned, Badtz-Maru, the grumpy penguin, is the best Sanrio character by a country mile, and all of the other ones are just taking up space that should rightfully belong to my Badtz. As I write this, there is a Badtz-Maru plushie staring at me from the exalted shelf meant for Special Toys that Little Hands Are Not To Touch. So when the guys on this show go on about their love for Pompompurin, or Hello Kitty, it’s like, hello, aren’t you forgetting someone?!? They’ve shown Badtz-Maru briefly (in a scene using live-action footage from a Sanrio store), but he’s clearly not a favorite for any of the boys on the show, thus will likely play a diminished role, if any; we’ll be lucky to see him show up in group shots with all the Sanrio characters. He’ll probably be standing behind Keroppi and we’ll only see like, one of his hair spikes sticking out or something. So, uh, on the one hand, this show is a pleasant surprise; on the other hand, they are not focusing on my favorite Sanrio character and thus should be punished severely. I haven’t yet figured out how this punishment will be meted out, but trust me, it will occur. …crap, I’m going to end up buying Sanrio merchandise again thanks to this show, won’t I? Goddammit. Yeah, I know. It bothers me when any series does that, even though I can’t think of another example off the top of my head. When Tomoyo was filming Sakura with a camcorder I was thinking “Shouldn’t she just be using her phone at this point?”, lol.